I have a dog named Precious that is six years old and although she is very friendly and loving with people, she shows major aggression with other dogs and is very protective when people come into our house. She has never bitten anyone, but at times she gets very nervous when she meets someone new and if they enter into our house I will put her up until the individuals sit down and I can introduce them. With newborn babies she has been good, but with the 2-3 year olds that run around, she gets that nervous look her eye and of course I get nervous and put her up. Over this past weekend my pitbull was able to bite our fence and break the board towards the bottom of the fence. There were two dogs (neighbors) that were at the fence. I had only let her out for 5 mins, she went thru the fence, and fought the two dogs on the other side in their yard. It took all my strength to get her off the dogs. I am 7 months pregnant and had to climb the fence. I am now just terrified when I have our baby that she may not like the baby. People say dog aggression and human aggression are different which I am aware of. At first, I thought my dog didn't do any damage to the two dogs (that are half pit). When they went to the vet, the vet saw a deep tooth mark on one of the dogs neck and another deep tooth mark on the other dog on her stomach. Both dogs had to get staples with a drainage tube put in. My dog also had really bad teeth marks/cuts in her right leg. So $1500.00 later that we paid for all three dogs in the ER, I am now heartbroken because I have never once in my life thought about giving my dog up. This was the first time my dog ever got into a fight with dogs, but there have been other times (when I walk her / when she sees another dog) that she shuts her ears off to me and there is no calming her down. With all of this said, I have had training with a behaviorist (before the fight) and she also saw how Precious was with other dogs and said she is not a social dog, but that I could work with as far as trying to get her attention. question is, although my dog is loving to me, is she always going to be like this since she is 6 years old? What happens when I bring the newborn home and I can't give Precious my 100% attention? I use to think I could trust her but after her fight (two days ago), I am now very worried. It is no one else's decision for me to give her away, but like I mentioned before, I never thought of giving her up until this past weekend which is killing me inside. My heart goes out to you on this one. As I'm sure you already know, a 6 year old pit bull that's dog aggressive and wary of humans is going to have a very slim chance of being adopted. She would most likely be euthanized if you took her to a shelter. At the same time, you aren't sure whether you have the ability to manage her issues and ensure everyone's safety. I understand your confidence in Precious is shaken after this weekend. But, it's not her dog aggression that is the real concern. It's her nervousness around people and your ability to control her when she is in a situation where she may encounter other dogs. It sounds like the behaviorist you consulted assessed her, but didn't actually work with you on her fear of people or your ability to get and keep Precious' attention. Or if she did, it doesn't seemed to have helped much. Whatever the case with that, it's important that you know that there ARE techniques that can be used to re-condition a dog's responses. But, given the time frame you are working in, I think you need professional help to make it happen. I would encourage you to find out who in your area really understands and works with pit bulls to rehabilitate them. I suggest you start by contacting rescues in your area and asking them who they use to evaluate and rehabilitate pit bulls. Two pit bull rescues that I know of in Virginia are Bully Paws and Ring Dog Rescue. Hopefully, this will lead you to find the right person to work with you and Precious and make the best decision for everyone involved. Good luck. I'll be thinking of you and Precious. Feel free to post back here if you have more questions. Just wondering how this story played out as my husband and I are in a similar situation. We have a female Pit Mix, Nahla, who is very particular about meeting new dogs. We have a baby on the way and while she hasn't had any aggression issues with people I still worry because she can be dominant toward other dogs. She does occasionally jump up on people in excitement and has nipped once or twice trying to get their attention. While not a behavior we desire, it was nothing that left any marks or appeared aggressive. More like an outlet for her excitement. She has been around young kids and has always been very gentle with them. Nahla has always been good with people, listens to our commands, and can be very submissive to us (if we tell her no or be stern with her she rolls right over on her back). She has done a few basic training and obedience classe which helped with commands, walking well on leash, and overall behavior- but didn't address her dominance. She does okay, for the most part, with other dogs. She has lived with other dogs and has play dates. The issue we have is her need to be dominant over every and all dogs, which rubs some dogs the wrong way and leads to fights. If playing fetch she would rather chase the other dogs as they chase the ball and then taunt them until they drop it. She doesn't even want the ball she is just showing dominance. She posts and flags her tail a lot. She usually stops with a verbal command, but will keep trying if not watched. The problem comes when another dog challenges back. She never had a fight that amounted to anything until last week. Usually it's just on hind legs and nasty sounds that stop immediately when we give a command. Last week she and my parents female pit mix (who have grown up together over the past two years and never fought like this, especially since the other dog is pretty submissive) landed themselves at the emergency vets following a fight over something they found outside (some old core of some good someone threw in the woods). Nahla has NEVER had an issue with food, even with other dogs she knows. I know our home life has been a little chaotic lately. We had a foster that Nahla was close with who just got adopted after a year and a half of living with us. We took in my parents dog while my dad is undergoing chemo and treatment for Leukemia. And we just took in a new foster who is a very loud and rambunctious puppy. Not to mention I am 5 months pregnant and don't know if she is picking up on that. I am not sure if all or any of this played a roll in this outburst (the puppy was outside near them and barking bad, I didn't help either because I started panicking and screaming for my husband rather than being a calm and authoritative leader). We have already decided no more fosters until we help our girl out first because clearly this was a cry for help. 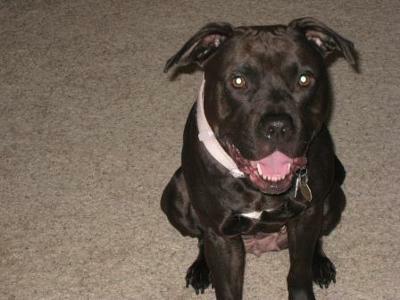 We plan to seek professional help but are at a loss for making sure this person knows the pit mentality and can truly help us implement a strong pack order at home to help Nahla feel comfortable once the baby arrives. I couldn't dream of giving her up, but I also want to be sure we do things right when the baby comes. I want Nahla to still feel loved and like part of the family, I don't want to exclude her from everything out of fear. But I need to know that her behavior can be redirected and her dominance can be worked on. Also looking for advice on how to help her adjust to life with the baby.